1950’s theme artwork and décor on the walls. 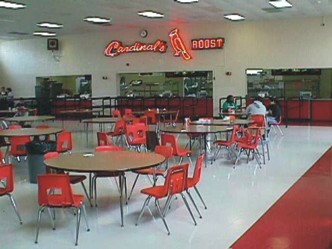 A neon jukebox that sets the sound level in the dining room – students don’t talk louder than the music. A “drive-in” kiosk with 2 TVs to show sports highlights. This school's transformation made the local paper! Before: The room was clean and neat, but lacked any visual interest for the kids, which caused this food program to suffer low attendance and participation in the cafeteria. After: This room is a "Happy Days" 1950's heaven. 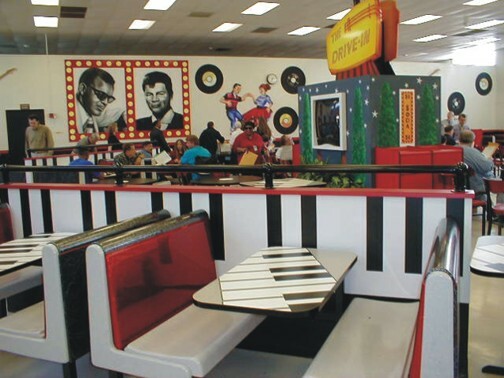 We put large 45 rpm records on the wall and piano key graphics on the tabletops and divider walls. The booths have red metalflake glitter finishes to show school colors.